With the blockchain mania at an all-time high, many organizations are scrambling to make sure they are not falling behind in this technological revolution. However, as plentiful as the benefits of the blockchain may be, businesses looking to implement blockchain solutions into their operations need to first ask themselves whether they really need the blockchain. Juniper research suggests that many organizations are keen to include blockchain technology in their organizational structures. All the same, Deloitte research reveals that blockchain-based projects have a high mortality rate. The ‘Evolution of Blockchain Technology’ report discloses that only 15 percent of blockchain-based systems deployed in companies are still active. These findings point to an inadequacy in the decision-making process that organizations employ before embarking on the path to include blockchain technology into their structure. Considering the significant resources that go into developing a blockchain system, it is imperative to effectively determine whether there is an actual need for it. Before embarking on the development of a blockchain-based system for your business, it is important to take a good look at your organization. The axiom ‘if it is not broken, do not fix it’ should be a guiding principle. Of course, there are always ways to better the performance and/or productivity of a company. 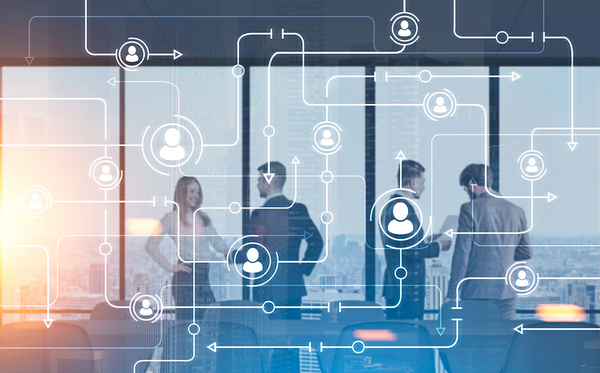 However, it is important to consider whether the inadequacies within the organization can benefit from an overhaul in the technology supporting the company or are likely to improve from a few tweaks in the organizational and operational culture. Are your business challenges behavioral or operational? Another way to look at this is that blockchain technology cannot and will not solve any operational issues that stem from behavioral inefficiencies within your organization. Once you determine the source of these inadequacies, you can make an informed choice. To address behavioral issues, look into new policies designed to work in this area. You could even hire experts to overhaul the structure and culture of the company in a way that will streamline things and improve productivity and efficiency. For that, you will not need the blockchain. Does your business use a database? The second factor to consider relates to the use of a database. Is a database an integral part of your company’s technological foundation? Does your organization rely heavily on a ledger to function daily? If the answer to this is yes, then your company may benefit from implementing blockchain technology. Conversely, if your company does not currently use a blockchain but is functioning well, then you may not need blockchain technology. 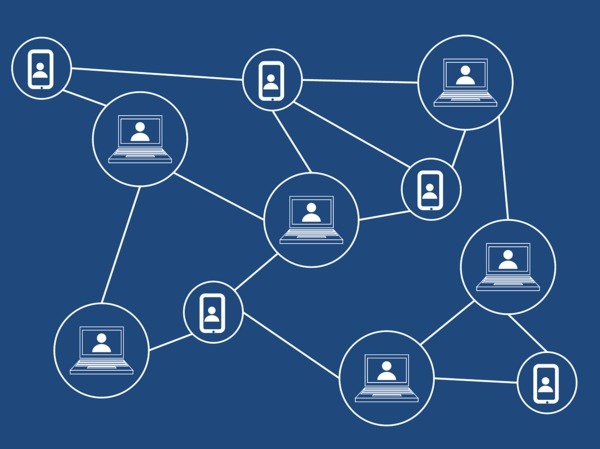 Implementing blockchain technology, in this case, may be a waste of time and resources and is likely to add further complexity to the structure of your organization. Does your business’ database have multiple participants that require edit access? Do many people within your organization need to be able to edit or otherwise add to your database? If many people need to access the ledger but only on a view-only basis, then you may not need a blockchain. However, if your database needs to be constantly edited by many different people, then your organization may benefit from creating a blockchain-based system for internal use. If your database is accessed by a large number of people on a view-only mode, you only need a few trusted writers adding data to your database. In this case, you may not need a blockchain. An inherent feature of the blockchain is its decentralization. Adding a blockchain in this scenario would not benefit your organization and may complicate things unnecessarily. However, if the people accessing the database need to be able to edit it while still being sure of the other parties, then you could use a blockchain. Blockchains provide a way for independent parties to trust each other. Therefore, if many people are editing your database, then including the blockchain will introduce a greater level of trust in your organization. Contemplate whether your organization will benefit from outsourcing the function of trust. In some cases, it may be more beneficial to keep the function of trust provider centralized. For instance, Google does a better job being centralized because it is able to track the actions of its users. This helps keep emails spam-free as well as provides certain security features. A blockchain would not work for Google’s current business model and would likely be detrimental to it. Similarly, if trust is not an issue in your organization, then there is likely no need to consider blockchain technology. Does your business’ database need to handle complex transactions? How complex are the transactions in your database? If the transactions in your database feature a high level of dependence on interrelation, then a blockchain may help alleviate the complexities of this system. Using a blockchain can help to ensure atomicity for all transactions that are contingent on each other. Additionally, there will also be a greater level of cost optimization as the blockchain can record such actions in the most effective manner without unnecessary costs. Conversely, if the transactions on your database do not heavily rely on each other, then you do not require a blockchain. You can simply create a structure within your database that allows for master nodes to instruct other smaller ‘slave’ nodes on how to act. Does your business suffer from the use of inefficient intermediaries? Finally, is your organization currently suffering from inefficiencies because of intermediaries? If yes, then you can benefit from blockchain technology. The blockchain is effective at eliminating the middlemen who contribute to bloated operational costs as well as longer operational timelines. 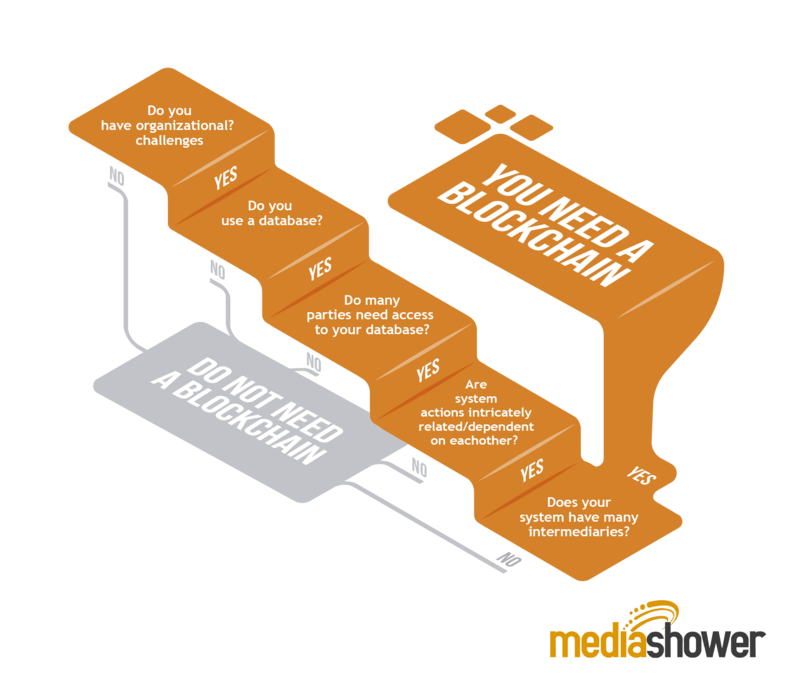 By answering the above-mentioned questions, you will have no difficulty deciding whether your business could benefit from a blockchain or whether you will be fine without it. To learn more about what Media Shower can do for you and your business, contact us today.